Whether you’re updating your existing kitchen or adding an extension, there are 10 key steps you will need to follow. Proper planning and preparation will help make sure you the final outcome fulfils your needs. A good kitchen companies Sydney will provide you with a kitchen designer. Always use the skills of an architect, architectural technician or kitchen designer – they have a wealth of design knowledge and know how to create a room that works perfectly with the rest of your house. Before you start choosing units and tiles, you need to understand the space you’re working with. Ask a kitchen company, an architect or architectural technologist for scale drawings. This will enable you to see exactly how much room you have to work with, and you can start planning how to make the most of it. Think about the location of internal and external doors and windows, so you have the best flow possible between your kitchen, outside space and the rest of your house. Have a clear idea of how much you want to spend before contacting a designer, as this will ensure you end up with a scheme you can afford. You need to design the kitchen layout to fit your lifestyle. If you want an open-plan kitchen-living-diner, think about where each zone will work best. It usually makes sense to have the kitchen in the darkest part of the space, with the dining and living areas – where you will spend more time relaxing – closest to windows overlooking the garden. There’s a growing trend for ‘broken-plan’ living, where the spaces are only partly separated –you may want to include a half wall between the kitchen and living space, or a pocket sliding door that allows you to divide off the dining room for more formal entertaining. Breakfast bars or islands are a key component of most kitchens these days, so work with your designer to decide the best location for yours. You don’t want it to interrupt the flow of the room, and may want to integrate your sink or hob into the island to allow the chef to interact with people using the rest of the space. You’ll also need to consider your glazing choices carefully, as this can make or break a design – do you want bi-fold or sliding doors? Would rooflights help bring natural light into the depths of the room? Now is the time to make these major decisions. Once you’ve decided on the best layout, you can start finalising the details. 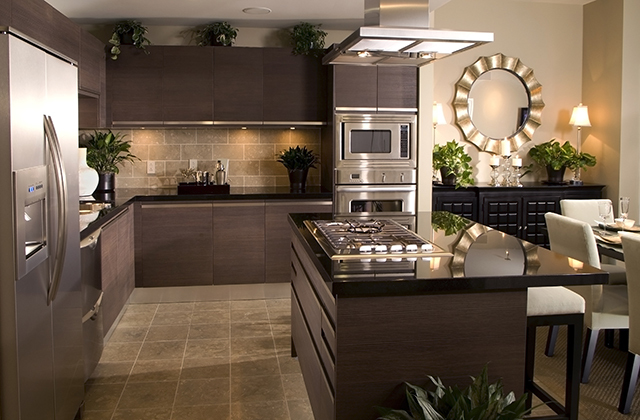 Do your research to find out exactly what style of kitchen suits your taste and lifestyle. For instance, if you have young children, smooth, wipe-clean units will be easier to keep clean than painted Shaker-style ones. You’ll have to live with the design for years, so it’s worth spending time getting it right. Use homes magazines, architectural websites, kitchen company catalogues, design books and Pinterest to pull together a mood board of what you like. Allow yourself a few months to do this and you’ll soon see key themes emerging. You’ll also need to finalise your budget at this stage to make sure you’re not looking at options out of your price range. Remember that just because you can’t afford high-end design choices like marble work surfaces, it doesn’t mean you can’t get the look with a cheaper alternative, such as a quality laminate. The huge range of kitchens on the market means, if you are willing to shop around, you can get a kitchen you love at a price you can afford. If you’re planning to make internal structural changes to your kitchen, such as knocking down the wall between your kitchen and dining room, you won’t usually need planning permission, as this is covered by permitted development. Even if you don’t need planning permission, it may be worth applying to your local planning authority for a lawful development certificate, which proves that the work is lawful, and can be useful when you come to sell. If you are planning structural changes, make sure you use the services of an approved structural engineer. Try our handy quiz, which will tell you instantly whether you’ll need planning permission for your kitchen extension. Once you’ve had your plans drawn up and permissions granted, you’ll need to find tradespeople you trust to carry out any structural work and install your kitchen. This could include a builder, joiner, plumber, electrician and decorator. For each of the different trades, you should get at least three detailed written quotes. Recommendations are always the best way to find people to work with, so ask friends and family before searching online. Some kitchen companies offer a complete design, build and installation package, meaning you won’t need to find individual tradespeople, although this is often more expensive. If you choose this option, again always get quotes from at least three different kitchen companies. Even if you’ve fallen in love with a kitchen offered by one specific company, chances are others will offer something very similar. Once work starts, making changes can be costly. Agree on all of the final details, including the handles, appliances and other details, and stick to them. It’s especially important to confirm the location of appliances, lighting and sockets, making sure sockets are in places that will be convenient, such as by the fridge and kettle. You should also consider where to put charging points and whether you’d like USB sockets. Now you have the team you want to work with and quotes agreed, it’s time for construction work to start. If you’re having walls demolished or an extension built, you may want to consider moving out while the work is complete. Alternatively, you could set up a makeshift kitchen – perhaps using your old cooker, sink and couple of units – in a different room. If you decide to stay, be prepared for dust, noise and disruption. If you decide to move out, make sure you visit the site regularly and are available to answer questions. While knocking down internal walls and stripping out an old kitchen should take a few weeks, building an extension is likely to take three months or more. During this time, walls, floors and ceilings will be constructed, cables inserted for electrics and pipes for water. Once the walls plastered, you should be able to get a feel for how your new kitchen will look when it’s finished. Now is the time to decorate the walls and ceiling. By painting before the units are installed, you’ll minimise the risk of drips and spills ruining your new kitchen. Opt for a wall colour that either complements or contrasts with your units. Although a plain white kitchen is timeless as it can easily be updated with accessories, consider going for a bolder wall colour, such as dark grey or petrol blue, for more of a style statement. Now it’s time for the most exciting part of the project – the installation of your new kitchen. Many kitchen companies offer an installation service for around £2,000, although most units can be fitted by a competent DIYer if you’re looking to cut costs. If you do choose this option, your extractor and cooker will need to be installed by an accredited electrician, and you may need a plumber to fit your sink and water-based appliances. Due to the cost of most worktops, it’s always best to ask a professional to fit these for you – mistakes can prove expensive. You could tile, add a splashback to your walls or install your chosen flooring before fitting your units, but you’ll be paying for extra materials that won’t be seen once the kitchen is in place, so it makes sense to complete these tasks afterwards, instead. Most competent DIYers will be able to tile or fit flooring themselves. Once the walls and floors are complete, it’s time to introduce the furniture, accessories and lighting, and start enjoying your brand-new kitchen. Introduce daylight from as many directions as possible — including rooflights and high-level or obscure glazed windows where privacy may be an issue. Prioritise the best quality space – with the best daylight and nicest views – to the functions that are most important to you, usually living and dining. For complete kitchen designs and costs, click here!